Modeling the effect of pressure propagation and tracer injection in the DUG-Lab. Dye tracer injection at the DUG-Lab. In this project, conventional solute dye tracers are used to characterize connected pore space, quantify stimulation enhanced changes in fluid transport properties, and to evaluate the effects of hot water circulation on the stimulated fractured rock. Additionally, we investigate novel DNA-labeled silica nanoparticles, i.e., DNA nanotracers, to validate and advance their application as hydrogeological tracers. The tracer tests were conducted as part of a pre- and post-stimulation hydraulic characterization of In-Situ Stimulation and Circulation (ISC) experiment (Amann et al. 2018) at decameter-scale at the Deep Underground Geothermal Laboratory (DUG-Lab) at the Grimsel Test Site (GTS) in Switzerland. As part of the SCCER-SoE strategy (Evans et al. 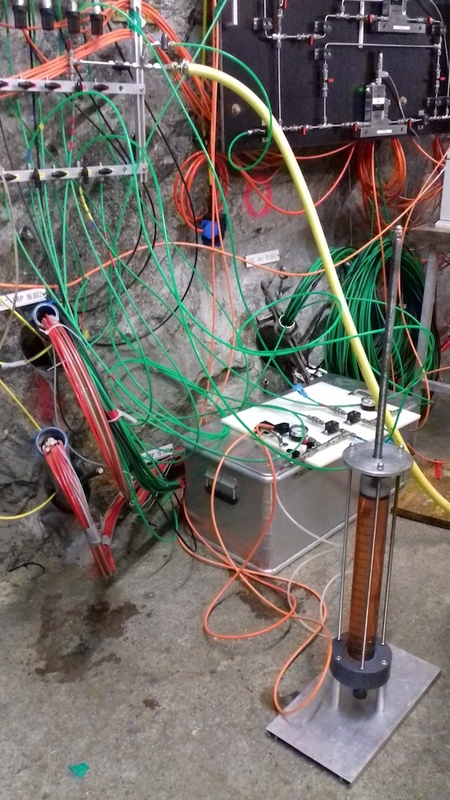 2014), the DUG-Lab at Grimsel in the Swiss Alps hosted experiments to demonstrate permeability enhancement and to characterize the created reservoir as a result of experimental enhanced geothermal system (EGS) development. Although the ambient temperature in the DUG-Lab of 13 °C is much less than the temperatures of EGS reservoirs, it allowed controlled and densely monitored experiments to be conducted on a decameter-scale to study permeability enhancement in granite. This project contributes to these studies by characterizing the pre- and post-stimulation flow paths in the test volume and by evaluating the effect of hot water circulation using tracer tests. In concert with the tracer tests, we evaluate the performance of novel DNA nanotracers in this fractured media for hydrogeological applications. DNA nanotracers are environmentally friendly, sub-micron sized spherical silica particles encapsulating small fragments of DNA (Paunescu et al. 2013a, b; Mikutis et al. 2018). DNA is nature’s own information storage system, and the encapsulated DNA can be designed with a unique signature for each test. Thus, the transport properties of the DNA nanotracers are determined by the silica particles, whereas the identification and detection of the tracers from samples is determined by the differently encoded DNA. This property allows repeat tracer tests to be conducted without suffering from interference from the earlier test. It also has applications in tracer tomography, as multiple similarly behaving but uniquely distinguishable DNA nanotracers can be injected simultaneously (Kong et al. 2018). We compare the transport of the DNA nanotracers with traditional and well-established dye tracers uranine and sulforhodamine B. The understanding of the transport processes of the DNA nanotracer, like any new tool, needs to be firmly established before its regular use in hydrogeological applications. 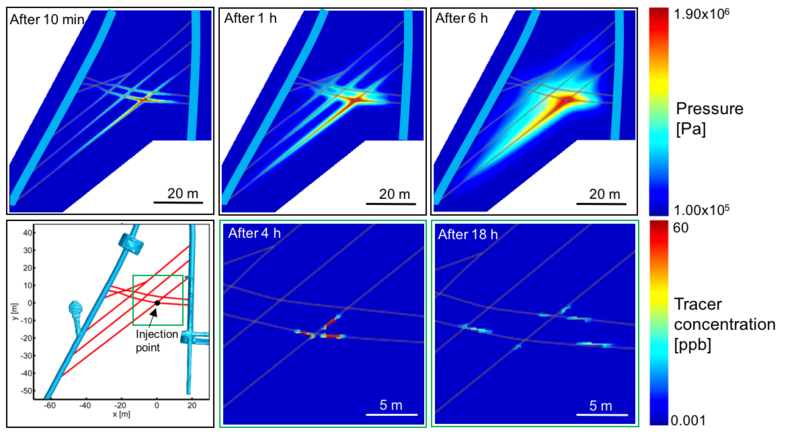 From previous studies of colloid transport in fractured media (Vilks et al. 1997; Becker et al. 1999; McKay et al. 2000; Albarran et al. 2013) we know that colloids travel with higher average velocity, and that water flow rate affects colloid retention. Also, due to the size exclusion effect (Sirivithayapakorn and Keller 2003), particles can only travel through pores larger than the particle diameter. This results in particles, such as the DNA nanotracers, to be transported in preferential flow paths and accessing smaller portions of the connected pore volume than solute tracers. The field tracer experiments in fractured media conducted with the DNA nanotracers in this project are to our knowledge the first of their kind. Fractures constitute secondary porosity in crystalline rocks with typically low primary porosity. These discontinuous structures often exhibit very complex geometries in which fluid flow and mass and heat transport take place. Although the characterization of fractured systems is challenging due to the complex geometries and natural heterogeneity of the properties of the fractured media, their characterization is a key factor for the successful development and management of subsurface reservoirs, such as enhanced geothermal systems. In EGS systems sufficient heat transfer between the reservoir and the circulating fluid, typically water, is required, which is achieved by hydraulically activating existing fractures and by generating new connections and promoting fluid flow through the system. In order to address the questions of i) how the hydraulic connectivity and flow geometry change as a result of hydraulic stimulation, and ii) what are the effects of circulating hot water (injection temperature of about 45 °C, i.e., about 32 °C warmer than the ambient) on the fluid flow, several tracer tests before and after stimulation and hot water circulation, respectively, were conducted. With the help of these tests we also consider whether the assumptions of increased swept volume due to stimulation, and weakening of hydraulic connections due to permeability-altering thermal effects are correct. Albarran, N., Missana,T., Alonso, U., Garcia-Gutierrez, M. and Lopez, T. 2013. Analysis of latex, gold and smectite colloid transport and retention in artificial fractures in crystalline rock. Colloids and Surfaces A: Physicochemical and Engineering Aspects, 435, 115–126. Amann, F., Gischig, V., Evans, K., Doetsch, J., Jalali, M., Valley, B., Krietsch, H., Dutler, N., Villiger, L., Brixel, B., Klepikova, M., Kittilä, A., Madonna, C., Wiemer, S., Saar, M.O., Loew, S., Driesner, T., Maurer, H. and Giardini, D. 2018. The seismo-hydromechanical behavior during deep geothermal reservoir stimulations: Open questions tackled in a decameter-scale in situ stimulation experiment. Solid Earth, 9, 115-137. Becker, M. W., Reimus, P. and Vilks, P. 1999. Transport and Attenuation of Carboxylate-Modified Latex Microspheres in Fractured Rock Laboratory and Field Tracer Tests. Ground Water, 37, 387–395. Evans, K., Wieland, U., Wiemer, S. and Giardini, D. 2014. Deep Geothermal Energy R&D Roadmap for Switzerland, 2014. SCCER-SoE, 43 p.
Kong, X.-Z., Deuber, C., Kittilä, A., Somogyvari, M., Mikutis, G., Bayer, P., Stark, W.J. and Saar, M.O. 2018. Tomographic reservoir imaging with DNA-labeled silica nanotracers: The first field validation. Environmental Science and Technology, submitted. McKay, L., Sanford, W. and Strong, J. 2000. Field-Scale Migration of Colloidal Tracers in a Fractured Shale Saprolite. Ground Water, 38, 139–147,. Mikutis, G., Deuber, C.A., Schmid, L., Kittilä, A., Lobsiger, N., Puddu, M., Asgeirsson, D., Grass, R.N., Saar, M.O. and Stark, W.J. 2018. Silica necapsulated DNA-based tracers for aquifer characterization. Environmental Science and Technology, in press. Paunescu, D., Fuhrer, R. and Grass, R.N. 2013a. Protection and deprotection of DNA—High-temperature stability of nucleic acid barcodes for polymer labeling. Angewandte Chemie International Edition, 52, 4269-4272. Paunescu, D., Puddu, M., Soellner, J.O.B., Stoessel, P.R. and Grass, R.N. 2013b. Reversible DNA encapsulation in silica to produce ROS-resistant and heat-resistant synthetic DNA ‘fossils’. Nature protocols, 8, 2440-2448. Vilks, P., Frost, L. H. and Bachinski, D. B. 1997. Field-scale colloid migration experiments in a granite fracture. Journal of Contaminant Hydrology, 26, 203–214. Sirivithayapakorn, S. and Keller, A. 2003. Transport of colloids in saturated porous media: A pore-scale observation of the size exclusion effect and colloid acceleration. Water Resources Research, 39, 1109–1119.